“The Post,” Steven Spielberg’s newest film, is the kind of movie that many people may need right now. Had it been released at any other time, this film may not have garnered half the attention or traction that it is receiving. Considering the current political climate in the U.S., “The Post” could be a relevant and an important film for viewers — an escape from the uncertainty of having a president who seems to disregard the most fundamental tenets of human decency. “The Post” tells the story of the Washington Post’s decision to publish the leaked Pentagon Papers in 1971 after The New York Times had been barred by federal court from doing so days earlier. The film is centered on Katherine Graham (Meryl Streep, “Kramer Vs. Kramer”), the timid publisher of the still fledgling Washington Post, and her editor, Ben Bradlee (Tom Hanks, “Forrest Gump”). Graham and Bradlee find themselves with a copy of the Pentagon Papers, an extensive report by the Department of Defense detailing how the Truman, Eisenhower, Kennedy and Johnson administrations had been deceiving the public about the extent and intentions of American involvement in Vietnam. Graham, who experiences constant marginalization in her own company for being a woman, finds herself in a unique dilemma. Either she could publish the papers at the risk of leading the Post to ruin for publishing sensitive government intelligence, or she could obey the law and keep her head down as the men on her board of directors insist she must. Spielberg clearly intends for this story to parallel the struggles news sources are facing today. This film is not nuanced by any stretch. Streep, Hanks and a host of other character actors constantly wax poetic about the importance of the free press — how the first amendment is the only thing keeping the president from literally becoming the state. The movie rarely feels like it is preaching. Is it cheesy at times? Yes, but Spielberg presents rhetoric that he feels audiences need to be reassured of, especially today. Spielberg’s entire intention seems to be producing, as meticulously as possible, a story of courage. He wants to present people doing the right thing against all odds for the good of their country because right now, people in positions of power are not doing that. 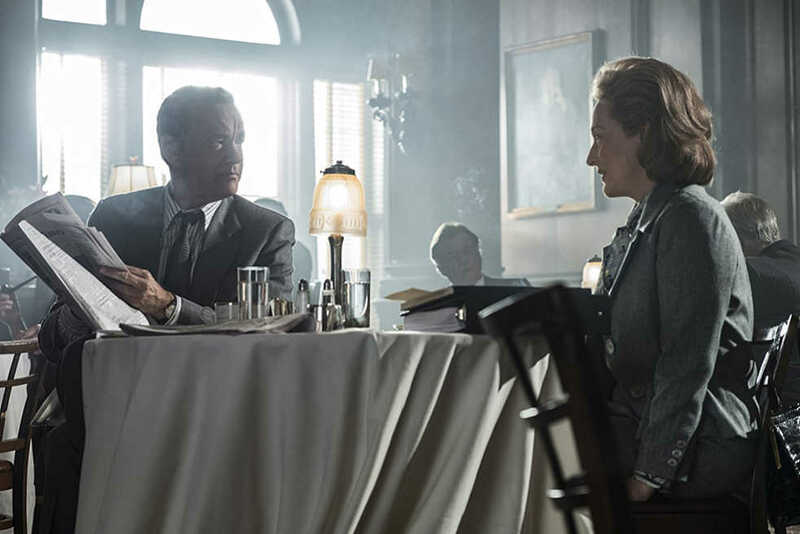 Spielberg shoots the Post’s newsroom in dynamic tracking shots, following characters as they storm from place to place, animated with the sense that they are taking part in history. Typewriters clacking, rotary phones ringing and the machinations of the printing presses punctuate every deliberation and decision Bradlee and Graham make. Almost every scene has a gravity to it, reminding viewers that what they are watching is important — that Americans have asserted their rights and freedoms successfully before, and though it may seem difficult now, Americans must do it again. However, gravity and importance do not make a movie. If this film were released two years prior, it would be just another prestige historical drama about people being “so brave” in the face of adversity. The monologues might attract eye rolls rather than snaps and claps of assent that fill some theaters when audiences watch the movie today. The acting would have come across as largely unremarkable and flat. While Meryl Streep plays Graham with an empathy and attention that seems to embody her internal conflict, Hanks seems to just play himself. The host of other character actors exist just to add more voices to the urgent back-and-forths that backdrop Graham’s dilemma. Even then, Graham ultimately seems to choose to assert herself simply because the script demands it. Richard Nixon, depicted as a silhouette seen through a White House window, is characterized as a Scooby Doo villain, comically bemoaning the newspapers’ efforts to expose him. All of these little slips would have surely resigned this film to be forgotten almost immediately after release but not in current society. As the #MeToo movement gained impressive momentum, as newspapers are working hard to expose the folly and deceit of the current administration, this film was met with impassioned applause. When Graham asserts her authority over the men of her newspaper, when she passionately stresses the importance of the press as an institution, some audience members clapped riotously. While some people consider blockbuster action flicks to be the height of crowd-pleasing entertainment today, with “The Post” Spielberg proves that he can entertain his 2018 audience just as well with words instead of CGI.